Your baby’s motor skill development begins at birth. From the very start, they are learning at an exponential rate about how to use their hands, their eyes, their mouth and their feet. They are also learning how to use these functions in conjunction with one another. These skills increase with age, and as your baby enters into each new phase, there will be more motor skill development. As a parent, you can help your child excel at these developments with a few very simple steps. In fact, you may not even realize that you are already doing some of these things as part of your daily routine. 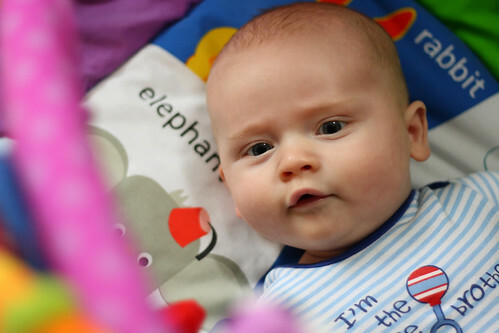 Even newborns can benefit from “tummy time” on a baby activity mat. These mats are equipped with dangling items for your infant to look at, pull on, make noise with, and explore. Each time they focus on an item, hear a sound, or pull on a toy they are making a neural connection. It is fascinating to watch, and it is stimulating to the baby. As they grow, more items can be added, further encouraging motor skill development. While this does not have a direct physical impact on motor skill development, many studies have shown that babies, especially newborns, who listen to classical music will have better cognitive skills. These studies also show that babies who listen to classical music have an easier time learning math when they enter grade school. When your baby is able to sit on their own, one of the best things you can give them to play with is several plastic cups and a ball. Babies of this age find it fascinating to place a ball in and out of a cup. This is actually helping them develop hand-eye coordination. Many babies will also put the cups in and out of each other in the same manner. Again, this is teaching them how to use their hands and what will happen when they perform a certain task. Play yards are an all-purpose accessory that every parent needs. Perfect for portable sleep and play time, these play yards can be equipped with a visually stimulating mobile or attachment or be filled with toys or a game that encourages motor skill development. The added perk of a play yard is that the baby is safely contained within, keeping them out of trouble and mom’s hands free. Much like the ball and cup method, building blocks are another way to help your baby improve motor skills and increase brain function. Unlike the ball and cup toy, blocks require practicing focus and concentration and can help to develop rational thinking. They must continue to try different methods of building until they discover what works. As you can see, there are numerous ways to enhance your baby’s motor skills with simple everyday products and activities. Of course, the best way to enhance and encourage any skill is to interact with your baby, to spend quality time talking and playing with them. You will discover your infant’s developmental progress directly related to the amount of effort and care you put into nurturing parenting and early education. Artist and author Molly Pearce is a busy mother who is always observing activities and products like a baby activity mat that can aid motor skills, coordination, and other brain functions for children. When her own kids were babies, she entertained them with big puzzles, nesting cups, blocks, and other mat toys.